The UZI name is a dominant presence in the firearm industry and widely acknowledged by the military, law enforcement and Secret Services. Let your voice be heard! 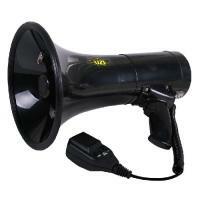 Ideal for crowd control or public events, UZI's 50-watt megaphone will record and repeat playback of vital messages. The megaphone has an audible range up to 600 meters. An included siren feature can be employed during emergency situations. The detachable microphone offers users added versatility. A shoulder strap accommodates convenient carry of the device. UZI's tool is powered by eight D batteries (not included). Measures 13.25" x 11" x 9"
It works well and broadcast very far and very loud. you just have to know how far away to keep the mic from your mouth when speaking and thats all. maybe a instruction paper with the product would help others to learn how and how not to use it :) thanks CopsPlus.